These heavy duty badge reels are made from heavy duty materials with a black front and a high quality chrome back. Each badge reel has a heavy duty metal belt clip on the back of the reel. These reels are available with metal chains, nylon cords and even steel wire cords. They offer either a heavy duty reinforced clear vinyl strap or a nickel plated split ring. Designed for rigorous use, these heavy duty badge reels are an excellent choice for nearly any application. 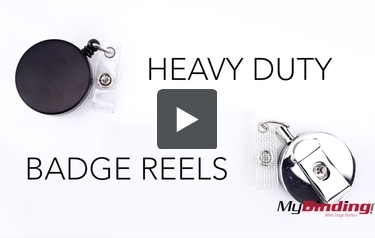 These are Heavy Duty Badge Reels! There are two types of vinyl straps you can get?there is normal, and the reinforced, which has fibers inside of it, and it connects to a metal piece verse the plastic. There are three options of cord type: the nylon is black and withdraws from the reel the easiest. All these badge reels retract automatically. Then there is the steel wire cord. It pulls out easy as well and is probably more durable than the nylon. To withdraw the chain, it?s easiest to pull it at an angle?it?s not the easiest to pull out otherwise. They have a strong metal clip to attach to anything fairly thin, like your clothes. Easily attach your badge reel via the strap to your name badge?or it?s holder. Snap it open, thread it into the hole and snap it back on. It can be slightly difficult to attach since the clip is so strong, but you know it won?t fall off at least. It extends up to 1 and a half feet long, which is just about an arm?s length. You can also get them with a key ring, also known as a split ring.